Ghana is no more HIPC!!!!! 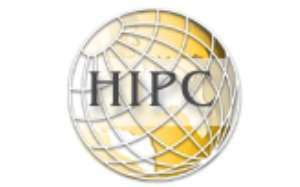 ... reaches completion point of HIPC Initiative Accra, July 9, GNA - Ghana on Friday reached the completion point of the Highly Indebted Poor Country's (HIPC) Initiative, a feat that would fetch the country varied financial and monetary reliefs. Mr Yaw Osafo-Maafo, Minister of Finance and Economic Planning, who announced this at a press briefing in Accra, said a meeting of the Board of Directors of the International Monetary Fund (IMF) at 1605 hours decided to award Ghana the HIPC completion point. He said the implications of this status "are many and varied and may be known after the World Bank meeting on Tuesday July 13 to confirm the IMF decision". The HIPC Initiative allows cash-strapped economies limited loan waivers, which in turn are ploughed back into poverty alleviation programmes. Ghana applied to join the league of HIPC nations in the New Patriotic Party (NPP) Government's maiden budget in 2001 following projections that Ghana's debt of 224 per cent of exports or 709 per cent of budget revenue was unsustainable. Ghana's debt at the time of joining HIPC was 6,025.6 million dollars of which 3,947.4 million dollars was owed to multilateral institutions and 1,588.1 million dollars was owed to bilateral creditors. Ghana at the time had medium term debt of 399.7 million dollars and a short-term debt of 150.0 million dollars. Mr Osafo-Maafo said, "Ghana is the only country that has achieved completion point in the shortest possible time in the history of the World Bank and International Monetary Fund." Ghana is expected to rake in a total of about 3.5 billion dollars from this feat, with 1.5 billion dollars coming from the Paris Club Members. The rest would come from the multilateral agencies spread over a 20-year period. This implies that Ghana would be receiving 100 million dollars a year from her multilateral donors. Mr Osafo-Maafo, who was flanked by Dr Anthony Osei Akoto, Deputy Minister of Finance and Dr Paul Acquah, Governor of the Bank of Ghana, said: "Ghana has been invited to Paris later this month to finalize the process to enable us finish with the exact agreements with our bilateral donors." Ghana reached the Decision Point in February 2002. The decision point is the stage at which Paris Club members meet over a members' application and approve certain indicators.